This is our first preMoksha event of the year. 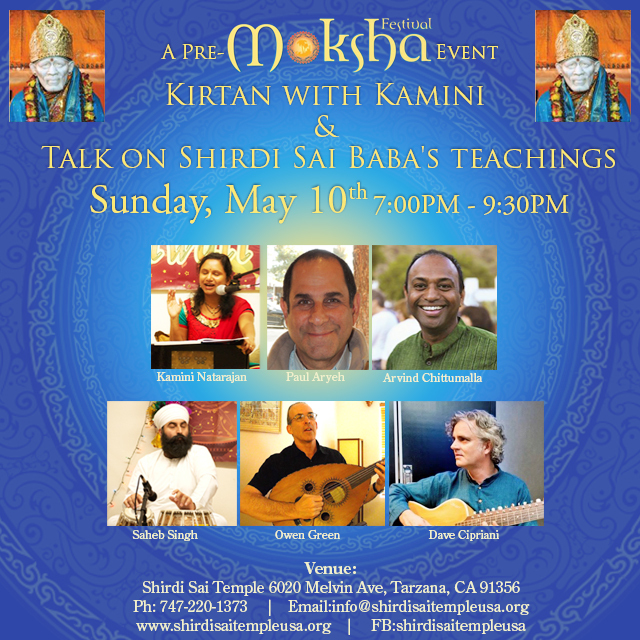 Please join us for some soulful kirtan with the lovely Kamini Natarajan and friends. Paul Aryeh from the Shirdi Sai Temple Baba temple will also give a talk on the teaching of Sai Baba, a saint from India. Suggested donation for the event is $15. This is also an opportunity to know more about the upcoming Moksha Festival in Los Angeles, on July 11th-12th. If you attend this preMoksha event, you can buy discounted tickets to Moksha festival in July.